First, remember that Phalaenopsis orchids typically bloom once per year—and sometimes you can coax them to re-bloom from a side spike after the initial bloom. But after the plant has expended all that energy on blooming, it needs time to rest and grow new roots and leaves to help support next year’s blooms. So when is the Phalaenopsis blooming season? 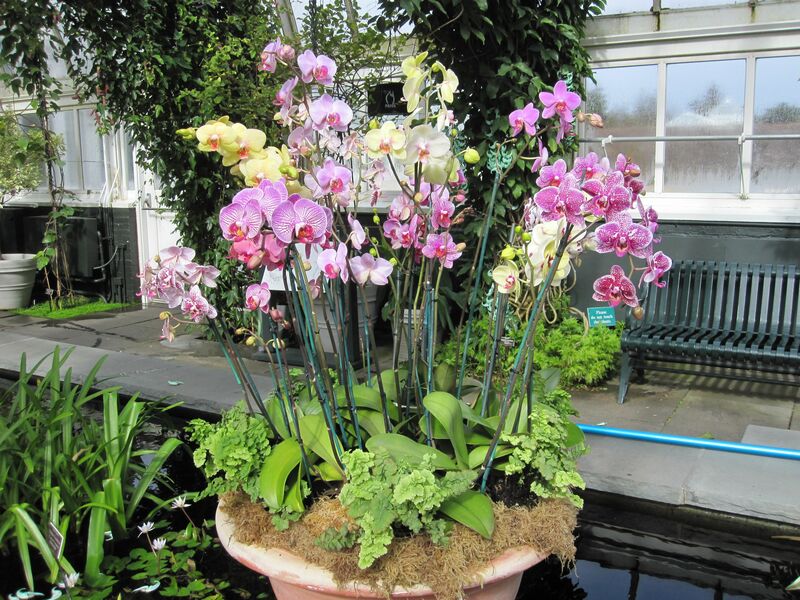 Generally these orchids bloom in the winter or spring, but with such a gargantuan variety of hybrids on the market and because commercial growers have the ability to control conditions, some will bloom in summer or fall. Given the ideal conditions, Phals will start to produce a new spike in the fall, and by mid-winter or early spring those gorgeous flowers will open up. What are those ideal conditions for getting an orchid to re-bloom? Just after a Phal has finished blooming is an excellent time to re-pot the plant. Phals don’t necessarily need to be transplanted into a larger pot (they actually like being pretty tightly potted), but taking the plant out of the pot, checking out its root health, and potting it in fresh medium will help prolong the life of your orchid—and increase the likelihood of future blooms! Don’t forget about your orchid just because it’s no longer in bloom. Phals need to be watered on a regular schedule year-round in order to produce those blooms you’re dying to see. Orchids don’t like “wet feet,” but you also shouldn’t let them dry out completely (and a humidity tray can help keep your orchids from drying out too quickly). 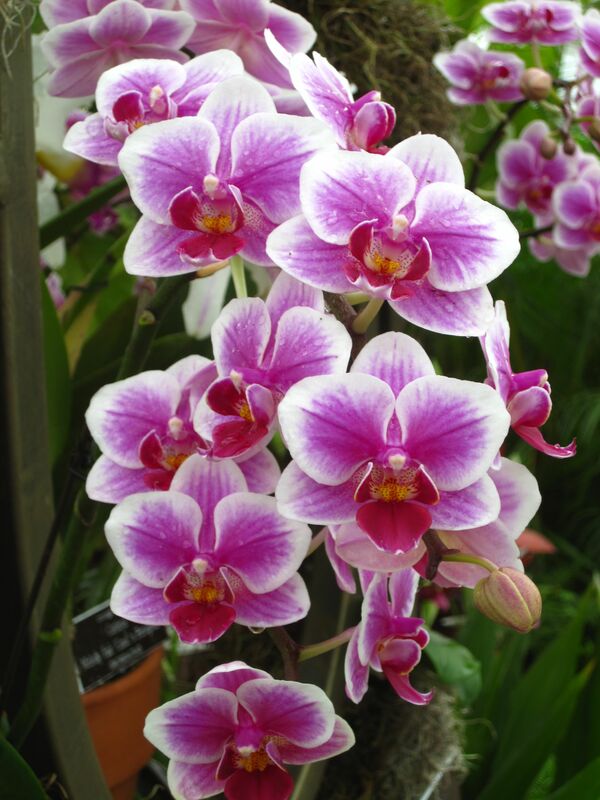 Get all the details on how to water Phalaenopsis orchids here! 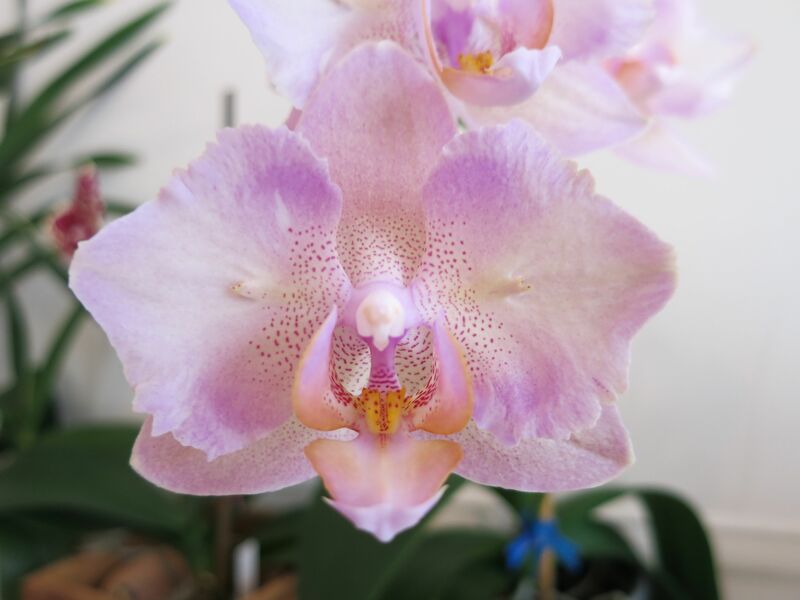 Orchids grown in the home need a little extra boost of nutrition that they probably aren’t getting from your tap water. This is why it’s important to stick with a regular orchid fertilizing schedule, whether you choose to do it monthly or “weakly, weekly.” Always, always water the plant BEFORE applying fertilizer. Putting fertilizer on a dry plant will damage the roots! Orchids need the right amount of light in order to stay happy enough to bloom again. Phals like bright, indirect light; a foot away from a southern-facing window, or on an eastern-facing windowsill should do the trick. A Phal’s leaves will tell you whether it’s receiving the right light: dark leaves edged with red aren’t getting enough light, and light green or even yellowing leaves are getting too much. With the ideal amount of light, a Phal’s leaves are typically a medium grassy green. Here’s the MOST important element in encouraging a Phal to bloom again: drop the temperature by 10 to 15 degrees at night. Remember earlier when I said that many types of Phals will start to put out a new spike in the fall? That’s the time of year when the nighttime temperature begins to cool off. Nighttime temperatures of 55 to 60 degrees Fahrenheit for a few weeks can help trigger a new spike. 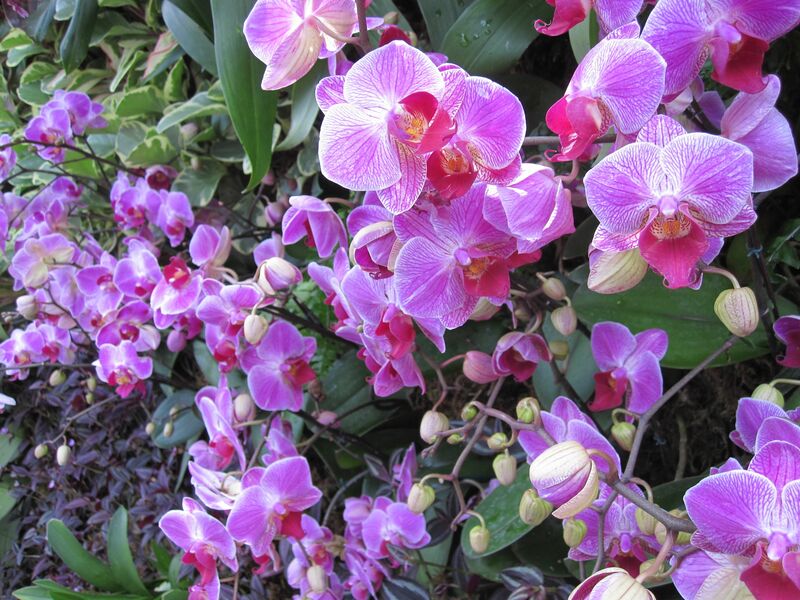 Happy growing and re-blooming, orchid lovers! Your blog is lovely! You’ve done such a nice job setting it up. Everything is so clear, easy to navigate, and appealing. It makes me want to buy a new orchid and try not to kill it. 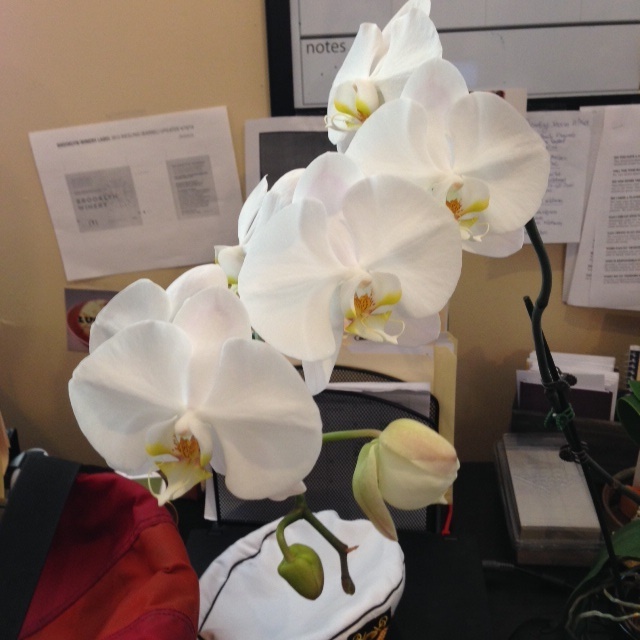 I have an orchid in my office window, which faces west (south window faces a brick wall, so that’s not any sunnier). Fall is about over and there are no new spikes poking up, but I have two nice, new healthy-looking roots poking up. Should I repot? If I don’t have a spike now, will I not get any blooms in the spring? The leaves are edged with red, but I don’t know how to give it more light. It’s a pretty sunny window. Hi Sparki, thanks for your question. When orchid leaves are edged with red that often indicates that they’re actually getting too much light. You may want to find a spot that gets a little less light; the leaves should be a bright grassy medium green color without red around the edges. If you haven’t repotted in awhile (or ever), this may be a good time to do so – that way you can take a look at the roots and trim away any that may be rotten. Phalaenopsis orchids generally begin to put out new spikes in the fall, but their spiking and blooming seasons do vary (especially those that come from big commercial greenhouses). Don’t give up hope – it may surprise you with a new spike when you least expect it!